Starting a new job or hoping to start a new job this year? Starting a new job or hoping to start a new job this year? Apochromatik’s Keith R. Sbiral was quoted by Money Crashers in this article on 23 Expert Tips for Your First Day at Work Starting a New Job. Wanting to making a change in your career but don’t know where to start? Apochromatik can help. Email keith@apochromatik.com or amy@apochromatik.com to learn more. Over the last three weeks we have looked at the yearly review process from the viewpoint of the person being reviewed. This week I will look at the review process from the other side of the desk. If you have been invested in your career for several years you likely have at least one direct report. That means you are in a small way responsible for helping them progress in their career through effective feedback that allows them to advance in their career, find their focus, and improve their weaknesses. This week we will look at the “management” side of the review process to ensure you are doing your job to improve the performance of those who work for you and improve the organizations overall performance and effectiveness. Do your reviews in a timely manner. Make sure you set aside the time you need to complete the review and give the review. Completing reviews late or not dedicating sufficient time to it can be seen as disrespectful and create a very negative environment as your employees wait for their review. I contend that every review falls into one of the two categories because you owe it to your employee to think of their review in this way. There is no purpose for an “average” review. If the employee is “average” make it your job as their manager to mold and improve their performance. It is more likely than not that the employee knows they are not meeting expectations. It is difficult to come to work every day and not get a sense you aren’t succeeding. Use the review as an opportunity to create a sense of relief for the employee by getting the unspoken out on the table and ensure them that your job as their manager is to partner with them to resolve the issue. Again, make sure you review specifics for the entire review period. Then take the extra step to make sure you create a nexus between those achievements and how they can become stepping stones to something even better. Perhaps use experiences you have had or observed in your career to make sure the employee understand why their achievement is important. Often the high achievers in an organization are those who get a lot of extra work dumped on them because they are who they are, high achievers. Make sure to take time during the review to find out if there are issues that are affecting their performance, areas of frustration, or specific issues that they have identified that need to be addressed. This can be an incredibly important treasure trove of information to improve the organization. In an age of team-based environments with interdisciplinary work and cross department working relationships, a yearly review can be a hierarchical process that can create tensions in normally strong and productive working relationships. Taking this process seriously and using the review process to its full potential can pay incredible dividends for you as their manager, for the organization, and certainly for the employee. Now what? You’ve prepared for your annual performance review and had your review. This week, the seven steps to take after your review to set yourself up for a productive, successful, and fulfilling 2018. It can be tempting to leave a good review feeling happy, set it aside, and get to work. And it can be tempting to leave a less-than-perfect review feeling frustrated and upset, set it aside, and distract yourself by focusing on the work on your desk. Unsurprisingly, ignoring your review is not a recipe for long-term career success (or your sanity). Here’s what to do instead. First, do not discuss your review with your co-workers or reports. Not even a little bit. Talking about positive feedback makes you sound like an arrogant jerk. Talking about areas for improvement can snowball and create an impression that instead of being normal (having an area of improvement on your review), your performance is subpar. And if you actually did have a negative review, you definitely don’t want to share that information. Even seeming relieved can backfire, conveying that there’s something wrong with your performance that your supervisor hasn’t figured out. Second, review the notes you took during your review and fill in any gaps. Fifth, sit down and carve out a 12 month professional development plan for how and when you’re going to achieve your professional goals for the next year. Schedule tangible goals (write an article) into the months you plan to work on them. For the goals that are harder to measure (“display more confidence,” “foster better relationships with clients,” etc. ), schedule reminders of those into your calendar as well. Finally, schedule time each week to review your list of goals and at least monthly to add to your accomplishments list. We’ll dive down farther into goal setting in the new year; for now, be sure your goals are measurable, realistic yet challenging enough to advance your progress, and that you make a note of why each goal is important. For example, a goal to write an article isn’t important because you need to check a box and say that you achieved a goal; it may be important because you want to raise your profile in the profession and learn more about the topic. Those “whys” for each goal will seem silly now, but you’ll be glad you have them down the road when you’re struggling to get going. Sixth, consider whether to ask for another review or conversation in three months to update your supervisor on your progress. This can be helpful if your supervisor doesn’t give much feedback normally and/or wouldn’t otherwise know about your progress. It can also be helpful if your review was less positive than you would have liked, or if you expect some movement within your group or an opportunity for advancement. The final step – step seven – is to consider whether coaching can help you achieve your goals for the next year. From management skills to executive presence, time management, and considering a career transition, we can help. Investing in your career by hiring an Apochromatik coach pays huge dividends. In addition, many law firms and other employers will hire coaches to work with those who have shown a commitment to improvement and to their career. Whether you hire us or your employer does, our goal is to help you eliminate distractions and distortions and build the career and life you want, rather than tolerate. Next week, we’ll wrap up our four part series on performance reviews by addressing how to handle reviews for people you manage. In the meantime, please share your thoughts in the comments. 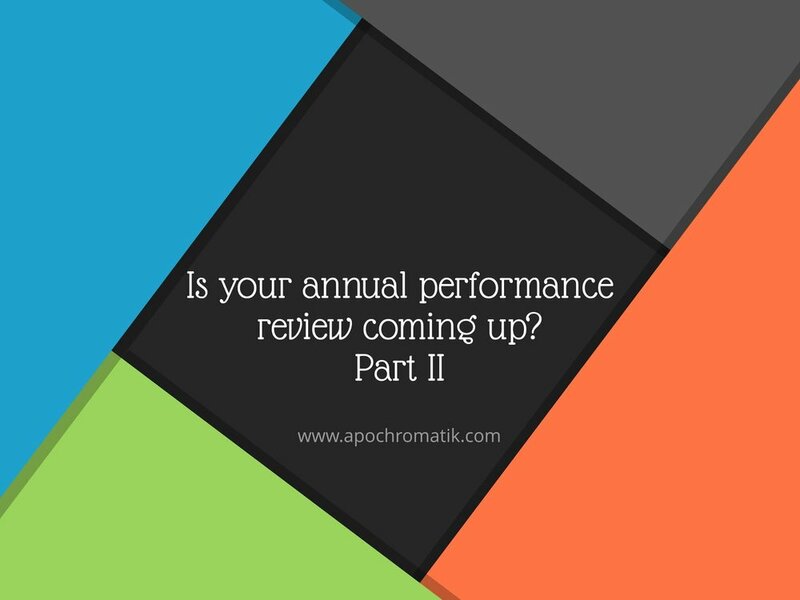 Last week we addressed how to prepare for your annual performance review. (If you missed it, click here.) Now, it’s time to think about how to handle the review itself. No matter how many times you’ve been reviewed, it can be a stressful and unpleasant experience, or it can launch you into success for the next year. We want to help you make it the latter. All of the steps discussed last week – reviewing last year’s review, taking action to address any lingering items, making an accomplishment list, reviewing this year’s form, thinking about goals for next year, and taking action to address potential new items – will put you on the right path to a successful review. Having prepared in advance, what not to do is obvious: don’t get defensive, don’t get angry, etc. But what to do and how to avoid pitfalls might be less obvious. Some employers have a formal system where reviews are scheduled in advance, while at others, supervisors just announce reviews are happening with very little notice. We’ll assume you have at least a day’s notice. First, have your materials ready. You’ll want to have a notebook and pen so you can take notes. (This is not the time to take notes on your tablet unless your office culture is such where everyone takes notes on a tablet all the time. And even then, think about whether the technology will create a barrier between you and your reviewer. ) You’ll also want a folder with the goals you came up with for yourself so you can refer to them and your list of accomplishments. Take those accomplishments and narrow them down to 5-6 key talking points to go back to, and include that sheet in your folder as well. (You may not need any of these materials with you, but if your boss asks what you think has been your greatest accomplishment over the last year, it’s better to open your folder and glance down than to stammer on about a minor achievement.) Side note: don’t be tempted to just take in loose pages. As a Skadden partner once explained to me, loose pages look like you grabbed something as you sprinted by the printer, while putting the same pages in a manila folder make it look as though you are organized. Once your materials are ready, it’s important to prepare yourself. Even if you work in a laid back office, you should still dress up a notch more than you normally do so you feel confident and send a message that you’re ready for the next step in your career. The most important preparation, though, is your mindset. A review is not an inquisition, and it’s not a referendum on your worth as a person or as an employee. It is not a good use of everyone’s time to just have a conversation about how amazing you are – it would be faster to just give you a smiley face sticker and send you on your way. And you probably don’t want to work at a job long-term if you’re never learning and growing anyway. Go into your review assuming it will be a dialog about what you’ve achieved over the last year, where you are going over the next year, and what you need to improve on to get there. Your goal is to leave the review with both you and your supervisor knowing what you need to do to have a positive review next year, and what you need to do to be ready for the next step in your career. The best way to achieve that goal is to take notes of what is said – both the good and the bad. I once walked out of a review, called my husband, and told him I’d had a terrible review. He asked what the reviewer said and I read him my notes. Out of several pages of notes, there was exactly one area to improve on, and the feedback was essentially “all junior associates need to improve their writing. You’re a junior associate, so you need to improve your writing.” Having those notes allowed me to read them back to a more neutral party and get a much more accurate read on my review. Notes are also helpful when you want to go back to them weeks and months later. It’s also important to not be defensive. That can be difficult to avoid if you receive negative feedback, so plan how to ask for details without becoming (or sounding) defensive. One of my favorite pieces of advice for situations like this is to “stay curious to avoid becoming furious.” In other words, approach the discussion about areas for improvement as an anthropologist would. Your goal, again, is to gather information. When you hear negative feedback, it can be tempting to want to know who gave that specific feedback if your review is encompassing responses from multiple reviewers. Even then, pause before asking the reviewer who shared a piece of feedback. If you truly think it is important/relevant to your future growth, it’s very different to say, “I’m confused by that feedback. Can you tell me what context or project it relates to?” rather than “I don’t understand that feedback and would like to talk with the person who gave it.” The first version focuses on your work, the actual topic of the review, while the second focuses on the person who gave you negative feedback, a topic that is largely irrelevant. No good comes of arguing in your review unless you feel there is something that is just plain wrong. If that is the case, rather than trying to defend yourself or getting angry, it can be better to say, “I’m surprised by some of the feedback you’ve just shared with me and need time to process it and reflect on it. May I have a day to digest and think about this and what I can do?” That will give you time to regroup and can prevent you from reacting out of anger in a way that can set you back far more than the underlying issue. It’s also important to accept compliments. This can be harder for some people than others, and hopefully your accomplishment list and advance preparation will help. When you receive a compliment, don’t try to talk the reviewer out of the compliment with responses like “well, it was not a big deal,” “I was only one part of the team,” or “I got lucky.” Instead, unless the reviewer is truly wrong (giving you credit for someone else’s work, for example), say thank you, and then be quiet. At the end of the review, the reviewer will likely ask if you have any questions or feedback. Now is the time to refer to your five or six talking points, and bring up any that haven’t already been addressed. It is also the time for you to drill down and make sure you understand what success looks like for the next year and what the expectations are that you need to meet (and hopefully exceed). This is particularly critical if your review has been very positive – it can be tempting to just be happy and relieved and want it to end, but you need that information so next year’s review can be just as positive, so don’t leave without it. Next week, we’ll address what to do after your review, and the following week we’ll discuss how to handle reviews for people you manage. In the meantime, please share your thoughts in the comments. You don’t have to be alone in working on your career. Coaching with Apochromatik can help with many of the issues you may be struggling with and want to address; we’ve worked with clients on developing confidence in meetings, improving client relationships, developing professional presence, and a host of other areas. We also work with clients who don’t know if they want to stay in their careers or with their current employer, including coaching them through deciding on the path they want to pursue, on interview coaching, and even resume review. Our past clients attest that investing in your career by hiring an Apochromatik coach pays huge dividends. In addition, many law firms and other employers will hire coaches to work with those who have shown a commitment to improvement and to their career. Whether you hire us or your employer does, our goal is to help you eliminate distractions and distortions and build the career and life you want, rather than tolerate. The end of the year means annual performance review time in many offices. If your review is coming up, here are some ways to set yourself up for success. First, let’s just assume you haven’t been keeping your review from last year in the center of your attention. If you have, great – this will be an easier process for you. But let’s assume that the year got away from you, resolve to do things differently next year, and focus on where you are now. Start by reviewing last year’s review. As you do, take notes on what items you improved on over last year, and what items you may need to spend more time addressing in advance of this year’s review. Specifically, were you given or did you set goals for 2017? Were you given skills to develop or improve? If so, did you? If not, you likely have at least a month to do anything you haven’t been able to do yet this year. Make a plan now for what items you can address, and schedule them into your calendar if they are tasks (“write article”) versus qualities (“be more confident in meetings”) or skills (“become a better public speaker”). The same advice applies for other professions; if one of your goals was to cut costs in a particular division but a supply shortage prevented success, research additional suppliers and start building relationships with them now so you have other options next time. For items that are qualities or skills and that you may not have fully addressed or improved on yet, make a game plan. Would getting additional training help? Or is it a matter of being aware of an issue? Resist the temptation to lament not addressing an issue in the last 10 months and remember that the recency effect means we often remember recent events more clearly than older events. In other words, if you need to speak up and be more confident in the weekly department meeting, just focus on the next ones between now and your review – they’re the ones you can address at this point and the ones your supervisor is most likely to remember anyway. Once you’ve gone through last year’s review, noted what you’ve already addressed, and then made plans for the rest, make a list of your accomplishments over the last year – the big and the small. We often focus on where we fell short, so making a list of your accomplishments will enable you to keep things in perspective (and will be helpful both for your review and to update your resume). In order to come up with a list of accomplishments, it may be helpful to go back through your calendar to be reminded of the client presentation you handled, the last-minute project you pulled together, etc. This will take some time, so set aside at least an hour to come up with your list, and then plan to add to it as you are reminded of additional achievements. When this seems like a hassle, add a recurring calendar item now to repeat this process at the end of every month next year – you’ll save yourself time, and have a more complete list. In that same monthly review session, plan to refresh yourself on your goals for the year, both the ones set in this year’s review and the ones you set for yourself. After you’ve made your accomplishment list, look at this year’s review form. That might or might not be the same as last year’s; some employers use a different form based on seniority, and some offices change their form regularly. Sit down with a blank version, and fill it in honestly based on this year. Include goals for next year. Walk away from it and then review it with fresh eyes tomorrow. As you review it again, do you feel that your self-evaluation has been fair? Were there things you overlooked? And are there things that you wish you had addressed earlier? This is the time to do it. It’s better to be able to say in a review, “Yes, I recognize that’s an opportunity for improvement, so just within the last month I’ve ______.” Far better to be able to show self-awareness and efforts to improve than to be stuck stammering. All of these steps – reviewing last year’s review, taking action to address any lingering items, making an accomplishment list, reviewing this year’s form, thinking about goals for next year, and taking action to address potential new items – will put you on the right path to a successful review. And with annual reviews having the potential to directly impact your income, your employment status, and your career prospects, investing your time now can pay off in your review. In the next two weeks we’ll address handling the review itself, what to do after your review (whether it is excellent or not), and how to handle reviews for people you manage. In the meantime, please share your thoughts in the comments. Keep in mind that you don’t have to be alone in working on your career. Coaching with Apochromatik can help with many of the issues you may be struggling with and want to address; we’ve worked with clients on developing confidence in meetings, improving client relationships, developing professional presence, and a host of other areas. We also work with clients who don’t know if they want to stay in their careers or with their current employer, including coaching them through deciding on the path they want to pursue, on interview coaching, and even resume review.